Fitbit-like tags researchers like Nick Whitney about what sharks have been up to. Nick Whitney is using tags to learn about what sharks do and where they go. “Our main goal with these things is to look at their fine-scale behavior...so these tags are kind of the ‘what are they doing’ tags,” said Nick Whitney, a senior scientist at the Anderson Cabot Center for Ocean Life at the New England Aquarium and a senior research scientists at the Newport Aquarium in Newport, Kentucky. Whitney has recently used the tags on blacktip sharks off the coast of Florida. “With these tags we are now able to look at their behavior in deeper water, at night, and learn all kinds of interesting things,” he said. 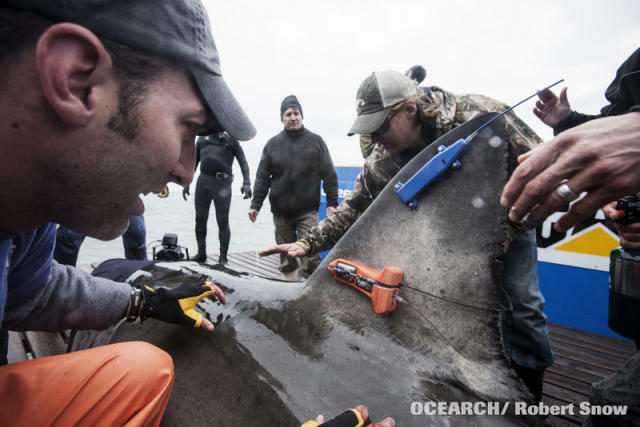 After a few days, the tags release from the shark and float to the surface. Then Whitney and his team recover the tags and download the data. “We’ve tagged hundreds of sharks now with this technology, and our overall recovery rate is about 94 percent,” he said. One important goal is to find out what happens to a shark after it is caught and released by a fisherman. “We’re just looking at whether the shark lived or died, and for that we’re mostly able to just visualize the data and look at the depth along with the tail beats,” he said. Whitney says there’s still so much to learn about sharks. “A lot of these sharks, we know fairly well now where they go, but we’re still not sure why they go to these different places or what they’re doing there,” he said.